Extreame Savings Item! Save 43% on the 3x 5ft Lighting Triangle Bolted Truss 15' span Stand Universal DJ Metal 5' NEW by Cedarslink at IGWT. Hurry! Limited time offer. Offer valid only while supplies last. MEDIUM DUTY TRIANGLE TRUSS LIGHTING 15' span Adjustable span from 5' to 10' and 15 feet wide! set of (3x) 57" Triangle Bolted Truss. 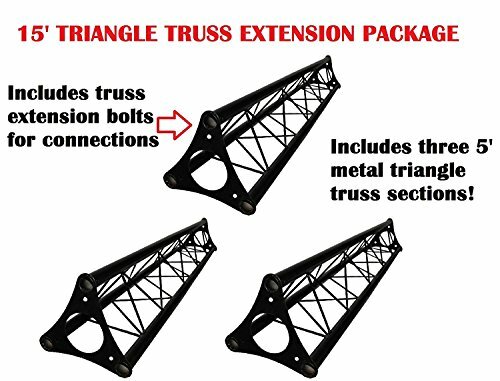 This medium duty triangle truss sections create nearly 15ft span. You can mount up to 200 lbs evenly. Truss pipes are 1.5" in diameter. Truss sections are 10 inches in overall width.